The days are getting cooler, especially at night, and I love to enjoy a cup of hot tea. 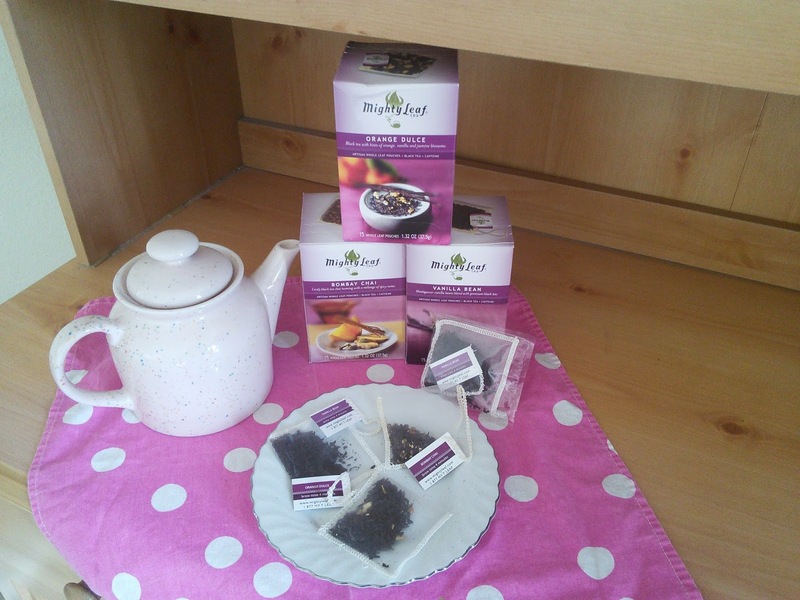 My favorite tea is Mighty Leaf Tea as they sell great tasting whole leaf tea in elegant cloth tea bags. They carry many different unique flavors of black tea, green tea, and herbal tea. 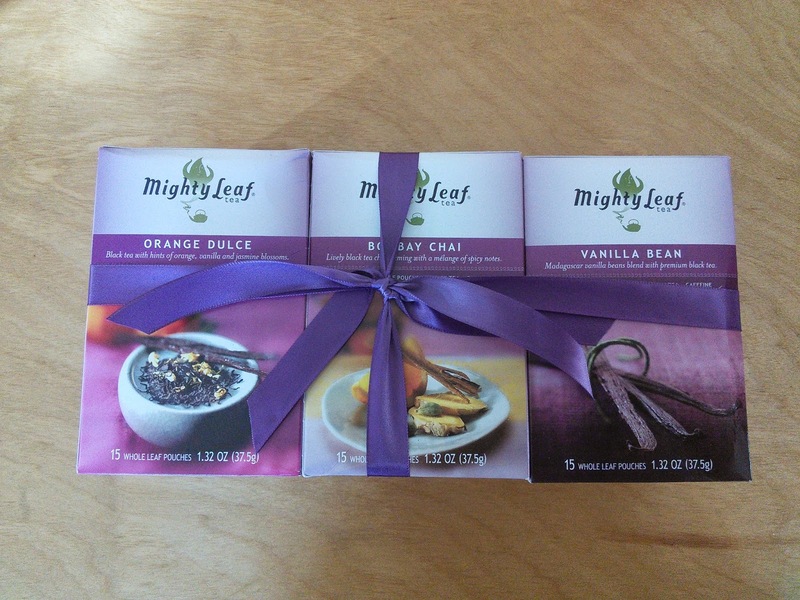 My favorite tea from Mighty Leaf is the Sweet Selections gift sampler. This sampler includes a 15 count tea pouch box each of wonderful flavors like : Orange Dulce, Vanilla Bean and Bombay Chai and the tea pouches are individually packaged in cello wrap. I just love that the tea pouches are made of silky cloth and you can see pieces of the vanilla bean, orange peels, and other spices in the tea mix. To me that means a great tasting cup of tea. The Orange Dulce flavored black tea is a luscious, rich brew teeming with notes of bergamot, orange, vanilla and jasmine blossoms. Made with Ceylon and China black teas, Orange Dulce brews up a fragrant and full bodied dark tea. Reminiscent of an aged Port, the flavor is sure to please. The Vanilla Bean black tea,is deep blend of black tea leaves with Madagascar vanilla, conjures up images of inhaling the heady aroma of wild vanilla as you hike the tropics near Mt. Maromakotro. A full-bodied and fruity cup, Vanilla Bean flavored black tea, a blend of Ceylon and China black teas, makes a deeply satisfying impression. The Bombay Chai is a melange of spicy notes conjures the steamy, aromatic delights of an Indian street market. Black tea leaves with subtle hints of pepper, orange, cinnamon, cardamom, and clove make up our chai, the Indian word for tea. Bombay Chai tea is delicious when brewed fresh and blended with heated milk and sugar to taste. You can purchase the tea buy the box ,in a cute gift set of three boxes, or in a case of 100 tea bags. The last two options give you a discount. I just love how the wrap the gift set of their three boxes with a wonderful bow. This makes for a wonderful gift for the holiday season. I am thinking of buying some gift sets to keep on hand for hostess gifts or for the unexpected gift someone gives you. Mighty Leaf tea is the perfect tea to serve at all your holiday gatherings. The tea is so festive looking. 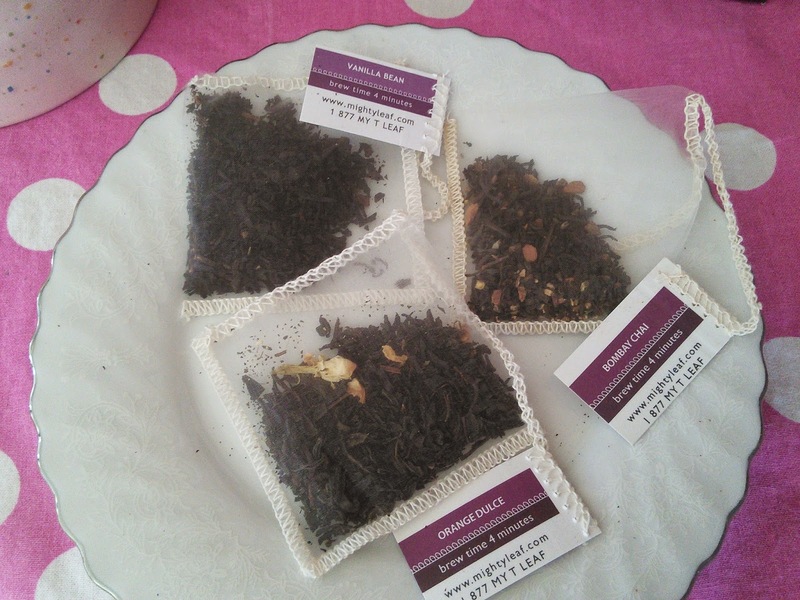 My daughter hosted a bridal shower tea party for her best friend this past summer and all the guests loved the tea. They said it tasted so good and that the tea bags were very fancy. The individual wrapped tea bags will look so nice on any holiday table. 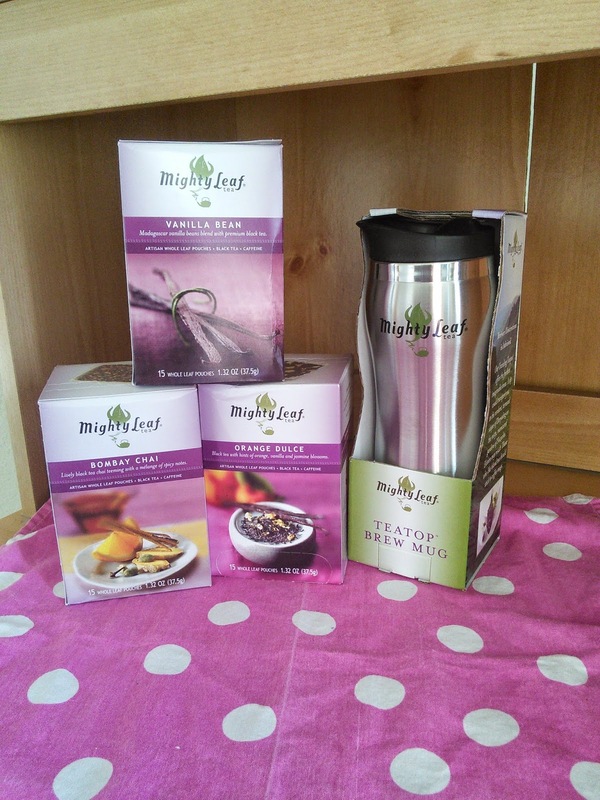 Mighty Leaf Tea also sells great looking Teaware like teapots and travel mugs. I love their TeaTop Brew Travel Mug for when I take tea to go. This cool travel mug is a "traveling teapot" which is perfect for enjoying whole leaf tea pouches. The brewing system is simple: Fold the tea tag in half and thread through the underside of the slit on the lid. Once the brew time indicated on the tea tag is reached, just pull up on the string. This squeezes the oils of the Tea Pouch into the infused beverage below and pulls the spent Tea Pouch up to rest in a domed area. You never have to drink over-infused tea again. The body is crafted of double-walled stainless steel keeping your tea hot, while staying cool to the touch. For more information on Mighty Leaf Tea, click on the below links. Sign up for Mighty Leaf email newsletters and receive a coupon for 15% off your tea purchase. I have a Sweet Selections gift sampler and a TeaTop Brew Travel Mug to giveaway to one of my readers. Just enter on the Rafflecopter form below and good luck! "These opinions are my own and I was sent the above mention products in exchange for an honest review." I would like to try the Organic African Nectar tea. I would like to try the Ginger Peach iced tea. I am such a tea lover. I would love to try all of them. My daughter would love this collection. She's a tea lover. Ceylon Kenilworth is my favorite tea. Oh my I'm huge tea fan. I think I am currently in love with the vanilla bean one but that could change quickly. Bombay Chai sounds like one I would enjoy. I would like to try Vanilla Bean. Vanilla Bean would be my favorite! I am a sucker for all things Vanilla!! I would like the Chamomile Citrus. I would like the vanilla bean tea flavor. The orange dulce black tea sounds yummy! I like the Ginger Peach iced tea...I won some of this before. I would like to try the Orange Dulce. These sound like great teas. Thank you for sharing, I will try just about anything once. My favorite of the Mighty Leaf I have tried was the Ginger Twist. I would like to try the Vanilla Bean next. I signed up for the Mighty Leaf newsletter. We use looseleaf teas a lot in our house, so I like the clean taste of the Pu-erh. :) Thanks so much for the giveaway! I would like the Ginger Peach iced tea. Vanilla bean tea looks interesting. The Chamomile Citrus tea sounds great! I like Orange Dulce tea! Since I love black tea, I would like to try their Irish Breakfast tea. I've never tried this brand, but I love black tea and breakfast teas! Especially flavored ones. I also think I'd like to try the tropical green tea blend! Bombay chai sounds right up my alley! I would like to try the Orchid Oolong. I haven't tried it yet, but I am interested in ML Orchid Oolong tea. I'd like their master sampler box but favorites? I like many different teas. Right now I'm enjoying ultra spicy chai. I like a good English breakfast tea. Also, a good "rolled" green tea can be very nic. Vanilla bean would probably be my favorite one to try. I adore Mighty Leaf Tea but my favorite is Orange Dolce. Thank you for the chance to win this awesome tea! The flavor that I would most like to try is vanilla bean. Signed up for emails with rsailorjohnson@aol.com! I would love to try Vanilla Bean and Orange Dulce. My favorite tea is Bombay Chai. I really like the green tea tropical,and the African nectar, ginger twist for a non caffeinated tea.